This family just adopted their adorable little guy, Luke, and he made the announcment so cute I asked to post it on my blog. 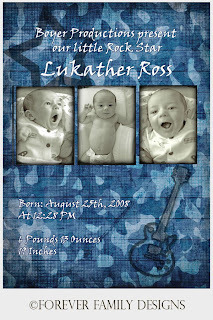 When Luke’s mom contacted me about designing the announcement she liked the design on one announcment and the camo paper on another. She also wanted to use the guitar as little Luke’s daddy is a guitarist. So we put all the pieces together, used their custom text and this was the result.